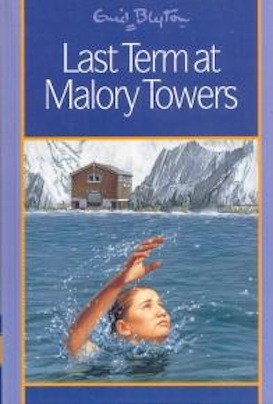 The above may be an interesting painting, but it's also a terrible cover for the final Malory Towers books. Girls on horses is so MT3! 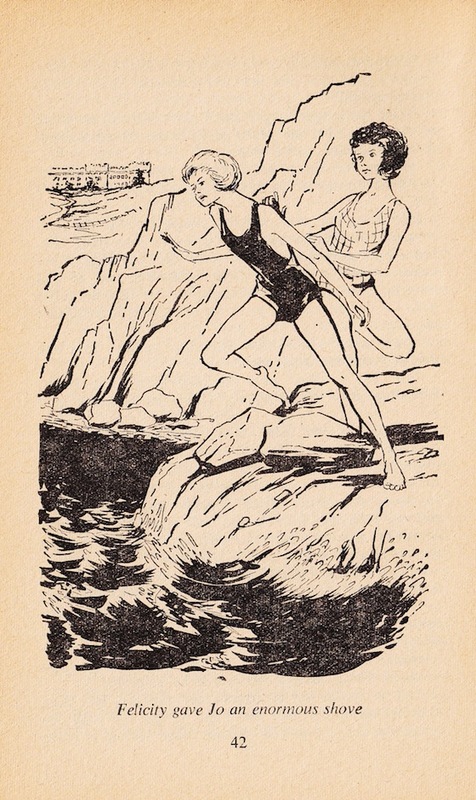 Girls in water is the essential motif of the final Malory Towers novel. Yet when the 1951 book was given a makeover in 1957, the newly commissioned artist was content to pretty well copy her precursor's misguided effort. So let's start this chapter in a different way. 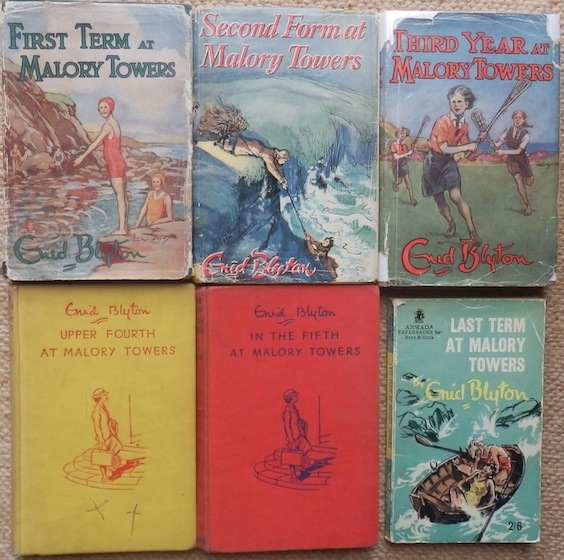 Here are my own personal copies of the six titles in the Malory Towers series. And here are the books without their dust-jackets, which better brings out two essential points. First, see the straight-backed dignity (mixed with no little awe) of the girl pupil mounting the steps to the front door of the super-school! Second, I do not have an original Methuen hardback of the sixth and final book, but an Armada paperback. This is because the original edition is relatively rare and so relatively expensive. 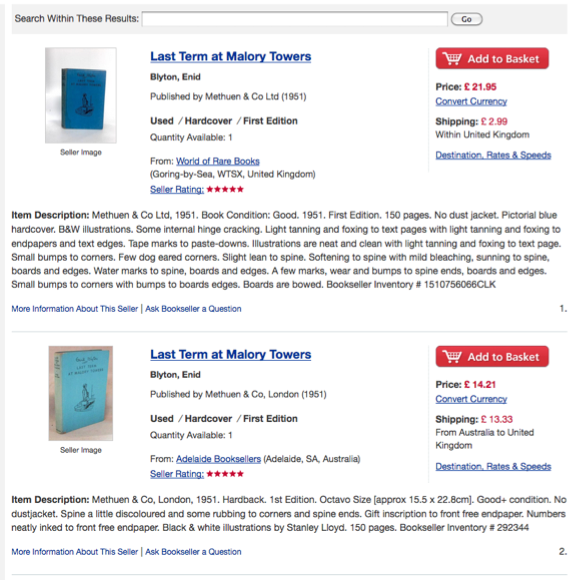 The screensave below shows that at the time of writing this piece (November, 2017) the cheapest copies available from Abebooks (the pooled resources of most of the second-hand bookshops in the UK and beyond) cost £25 when postage is included. I would love to add this book to my collection. But not at the price presently being asked. After that, the file contains a contents page that Enid has put together. She has done these three preliminary pages after first typing out 192 sheets of the novel. 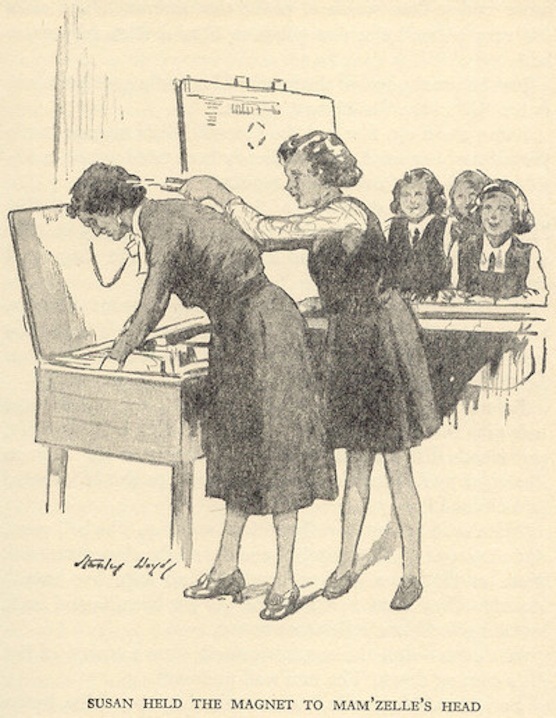 The pages reveal that Enid typed the book more or less perfectly the first time of asking. There are no structural changes. Not even any pinned paragraphs to replace paragraphs she felt had too many pen alterations in them. Just a word or item of punctuation changed here and there on the typescript in Enid's blue ink. I ticked a few things from the typescript to the 1992 Dean's copy I had with me. But I soon stopped that as there was perfect concordance. In the train to Newcastle, I read much of MT6 and that's what I'll turn to now. Last Term does not say much about Darrrell, Alicia, Belinda or Irene. Nor about Felicity. It concentrates on Jo, a spoilt girl in the second form. June, also of the second form, and Amanda, the superb athlete who has come to Malory Towers in the sixth form because her old school has burnt down. 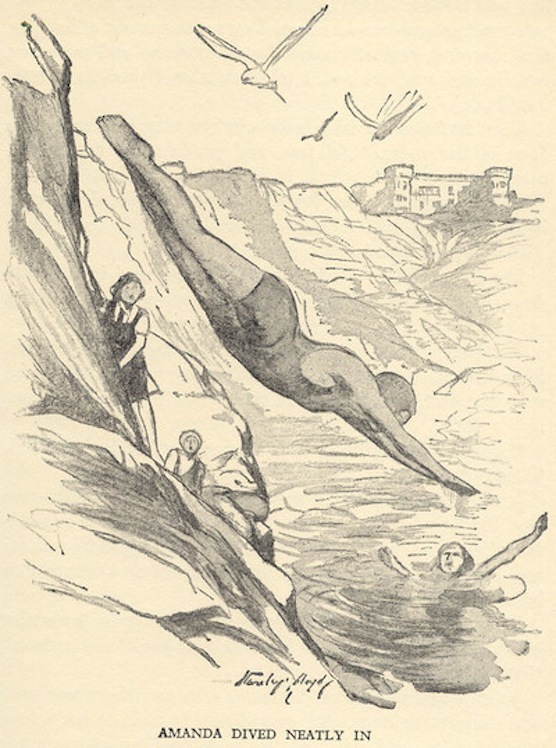 'A fat and ungainly girl stood shivering on the brink of the pool. She was yelled at by some of the second-formers already in the water. "Get in, Jo! Come on, Fatty! If you don't buck up, you'll have exactly two minutes in the water, and that's all." The above is Stanley Lloyd's drawing that features in the 1951 Methuen hardback (that I haven't got). And above is the drawing in the Dean hardback that I had with me on my trip to Seven Stories. 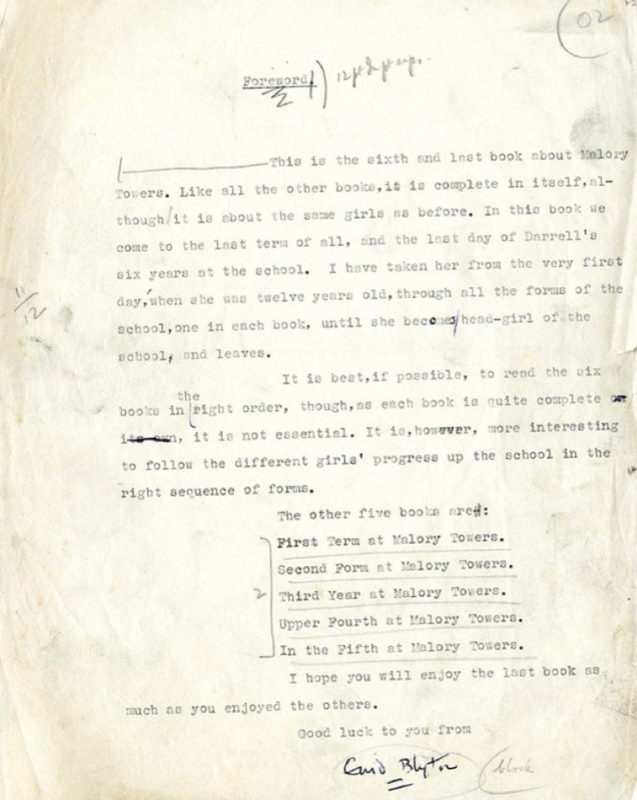 The motif is continued in chapter 11, 'On the tennis court and in the pool'. By this time, the outstanding, sixth-form athlete, Amanda, has given herself the task of training second-former June (she of the spiteful anonymous letter campaign of MT5) who Amanda realises has much sporting potential. It's just a matter of whether June can subject herself to the rigorous training regime in tennis and swimming that Amanda offers to imposes on her. As June and Amanda, after a tense training session, walk from tennis court to pool one day, spoilt second-former Jo is boasting about her father's fleet of cars. Getting in Amanda's way, she is pushed into the water. Jo falls into the deep part of the pool and she can't swim. Darrell yells out this information and June swims out to her. Jo panics and June is not able to control the situation. Amanda dives in, tells June to let go of the terrified child, and most effectively deals with the situation. First, by slapping Jo on the face to deal with her panic and get her attention. Clearly the Armada paperback edition is again a complete steal of the above illustration. For copyright reasons, perhaps, the original illustrations couldn't be used. But by sticking to so much of the original drawing that would be a breach of copyright anyway. Still, who cares now. The Dean illustration from the 1992 edition is at least a bit different. 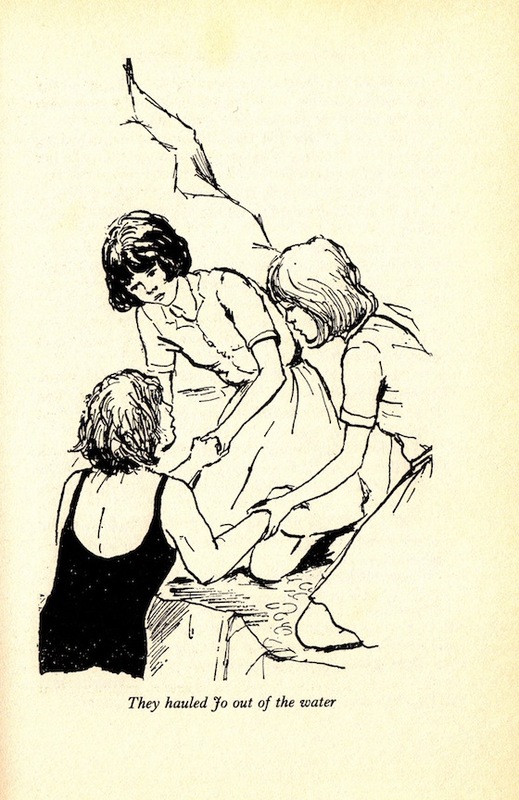 It's Moira, Darrell and Mary-Lou who help Jo out of the pool according to the text. But, I repeat, this major theme in the book is essentially about Jo, June and Amanda. 'Amanda felt the strong, swift current beneath her. How could she ever have laughed at it? It was stronger than ten swimmers, than twenty swimmers! It pulled at her relentlessly, and no matter how she swam against it, it swept her in the opposite direction. Fortunately, June, who is also up early but for a swim in the pool, spots that someone is in trouble in the sea. The only practical thing to do is to take a rowing boat out onto the water. So brave young June does this. By this time, Amanda has been utterly humbled. The humbling of Amanda is what the book is primarily about. Just as children can be made weak by poor parenting, so even the strongest are vulnerable in life. Everyone needs other people. 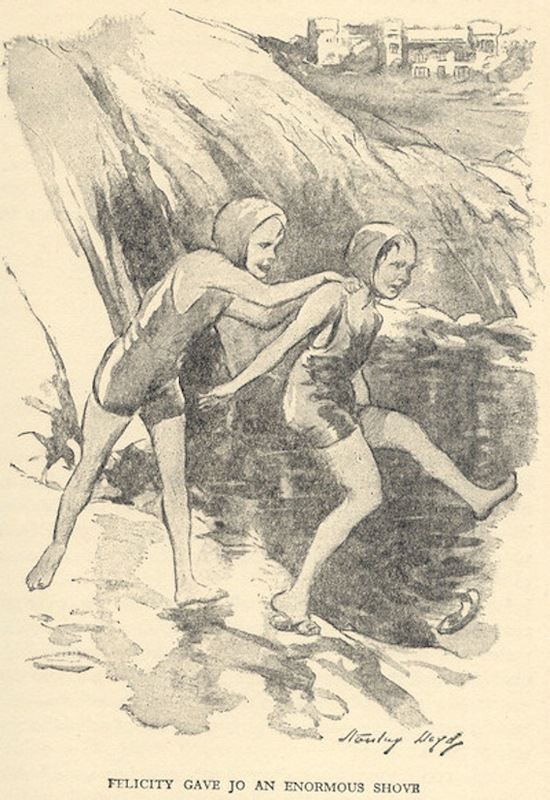 Later editions of the book have had the insight to use this image of struggling Amanda as the book's cover. Hang on a minute, that may be wrong! The above images might be of Jo struggling in the pool prior to her rescue by June and Amanda. 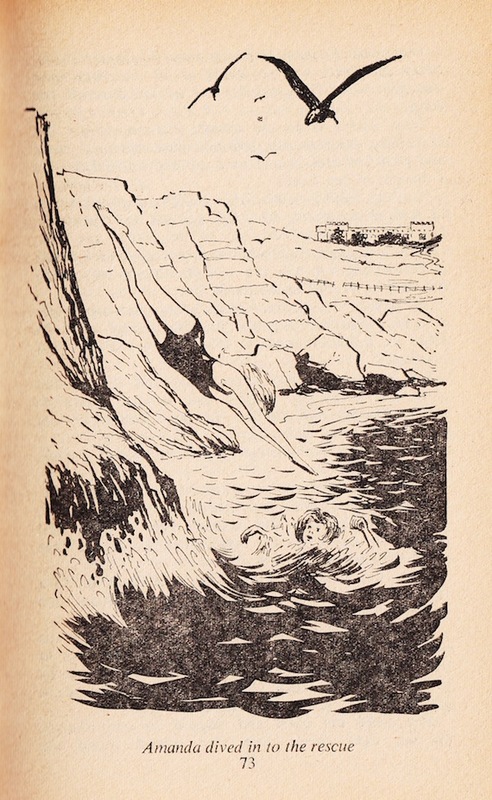 Which gives me a chance to emphasise how effectively this swim/rescue motif is worked through by Enid Blyton working at top speed straight onto her typewriter from no plan. Did Enid have to go back and tweak the scenes in order to better bring out the development? No, she did not. The work had all been done by her subconscious, and so Enid just went with the flow. A very strong current indeed. To summarise this motif. First, Jo is pushed into shallow water and struggles back to shore. Second, she is pushed into the water and rescued by Amanda when June is unable to life-save. So what will happen the third time, when it's the once-strong Amanda who is struggling and June who is her only hope? Brave and resourceful June saves Amanda. Yes, June has risen to the occasion and has shown that Amanda was right about her courage and her strength. What a gorgeous print of a cover by Mary Gernat. Later, June visits Amanda in the school sanatorium. Both have been humbled by Amanda's near-death experience. Amanda, though her own sporting ambitions have been put on hold (at the very minimum) by the damage her leg has sustained on the rocks, vows to coach as many of the younger children as she can. 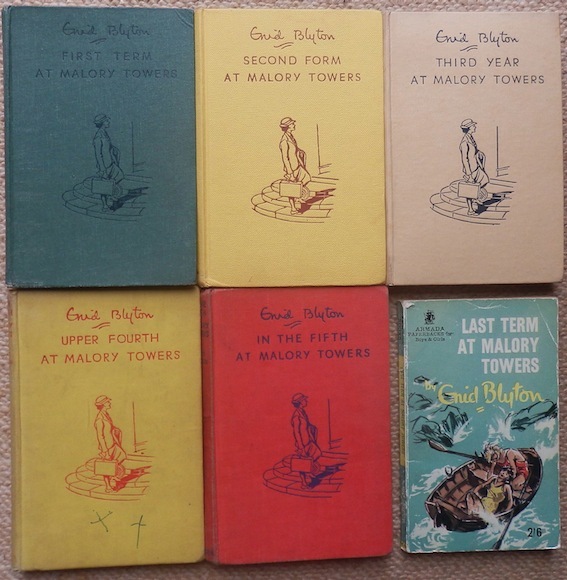 While June will see if she can get into the second teams (an extraordinary achievement for a second-year) and help Malory Towers do well in the inter-school championships. But back to Jo. She is a major character in the book, as weak initially as Amanda is strong. Her problem is that her father spoils her. He sends her five pounds, which Jo loses. She ends up retrieving nine pounds from the school bursar and does not have the courage to give back the extra four pounds. Jo shares the money with Deirdre, a first-former who is easily led astray. With Jo under pressure from school authorities and her fellow pupils, she persuades Deirdre to run away with her. The brief search for the girls is what justifies those dust-wrapper covers at the top of this page. Except it doesn't justify them. Anyway, the illustrators all pile in to the tracking down of Jo and Deirdre. 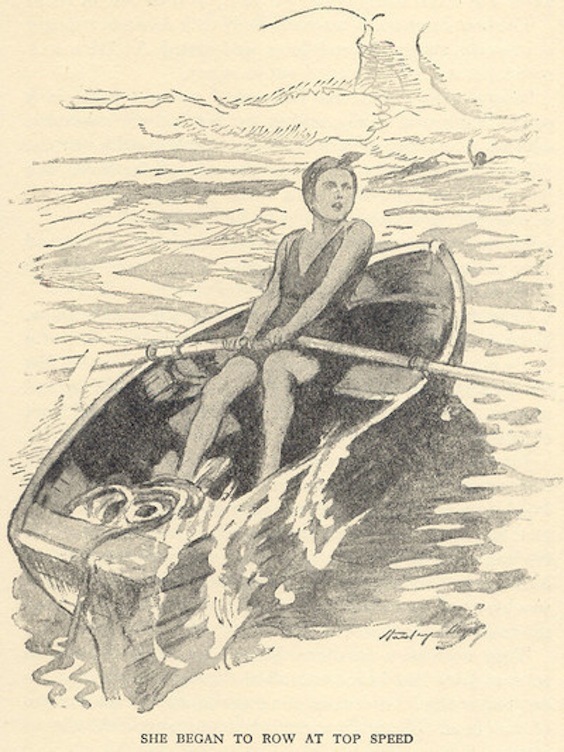 The above illustration by Stanley Lloyd inspires a straight (but largely inferior) copy by Dylan Roberts in in the 1964 Armada paperback. While Jenny Chapple in Dean's 1992 edition gives us a close up of the trapped girls. The headmistress despairs of Jo. I mean she expels her, coming to the conclusion that however good a school it is, Malory Towers cannot counterbalance the bad influence of Jo's father. And that, as a result, other girls come under risk. Indeed, Deirdre is almost expelled as well. But when Deirdre shows how she would feel if she was to be expelled - the hurt she would cause her poor father - Miss Grayling realises that what she is witnessing is genuine remorse. So Deirdre gets to stay. In parallel (and in contrast), sixth-former Gwen, who has been the spoilt child from MT1, also comes a cropper. She has a supportive father, but has long been spoiled by her mother. Gwen has been putting pressure on her father to send her to a Swiss finishing school and her long-suffering dad has finally agreed to this, though he can't afford it. 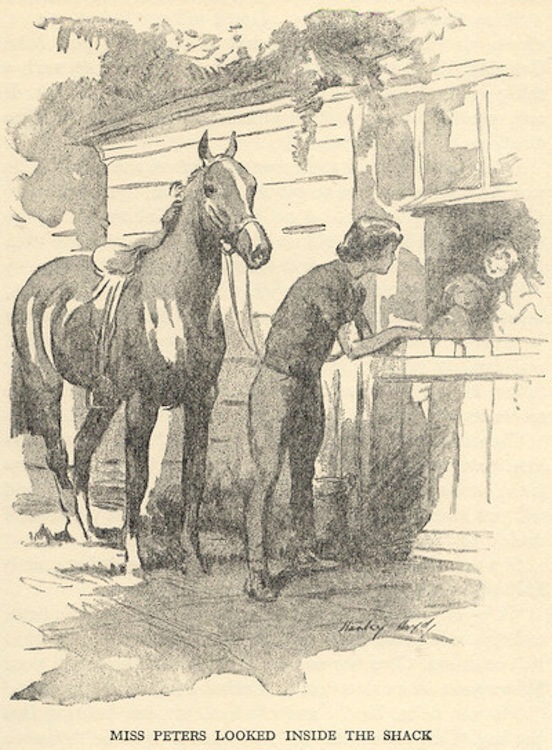 Near the end of the book, Gwen is told that her father is dying and she immediately regrets her selfish behaviour. After Jo has been expelled and Gwen has had to leave school to look after both her parents, Darrell gets a letter from each of them expressing regrets at their follies. 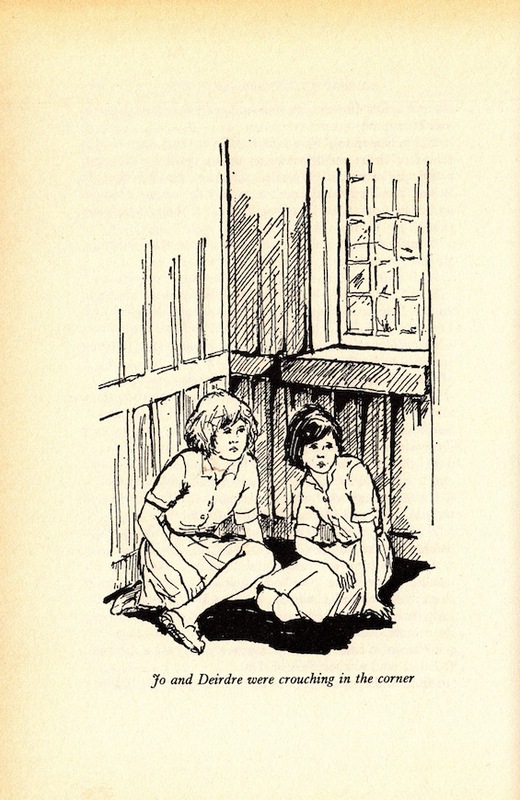 Darrell replies kindly to both, knowing that it is important to these black sheep to feel they still have some connection to Malory Towers and their ex-schoolmates. Rejecting them further would only deepen their misery. Jo, June, Amanda and 'strength of character' brought out by the theme of water. Jo, Deirdre, Gwen and their relationships with their fathers. Those are the two triangles that the book weaves between, with interludes of high jinks. A juggling act that Enid, with her photographic memory, manages without apparent effort. Remarkable. In the last chapter, Darrell, her best friend, Sally, vivacious Alicia, and equally quick-witted Betty, leave Malory Towers for good, destined for St Andrew's University. 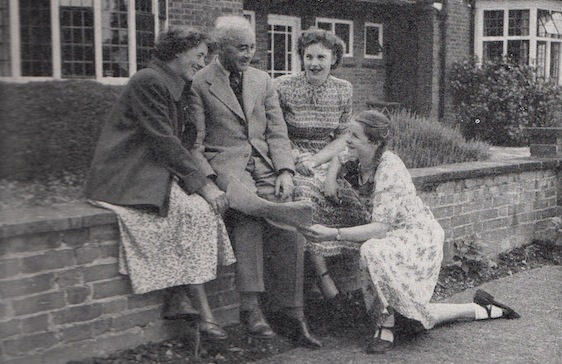 Though MT6 hasn't primarily been about this particular quartet of sixth-formers, Enid has kept them in the loop, partly through a campaign of tricks against the French teacher. Really the poor woman gets bullied by second-formers and sixth-formers alike. A powerful magnet is used to remove the hairpins from her bun, time and time again. Too much, Enid, call these cruel girls off! Before mam'zelle has a nervous breakdown! This last is a reference to a boy Gillian had met in the first year of university, and she repeatedly writes of her love for him, and the misery that engulfs her when he doesn't write to her. Such adolescent concerns are beyond Enid's remit as a writer, so one can see why she didn't follow Darrell and co. to university. 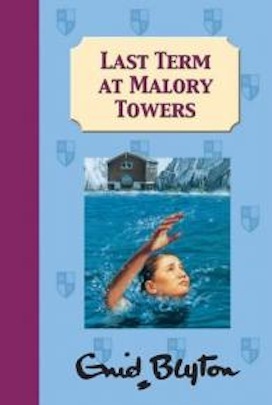 But why didn't she return to Malory Towers to follow the progress of the second-formers, June, Felicity, Susan, etc? That is a telling question. 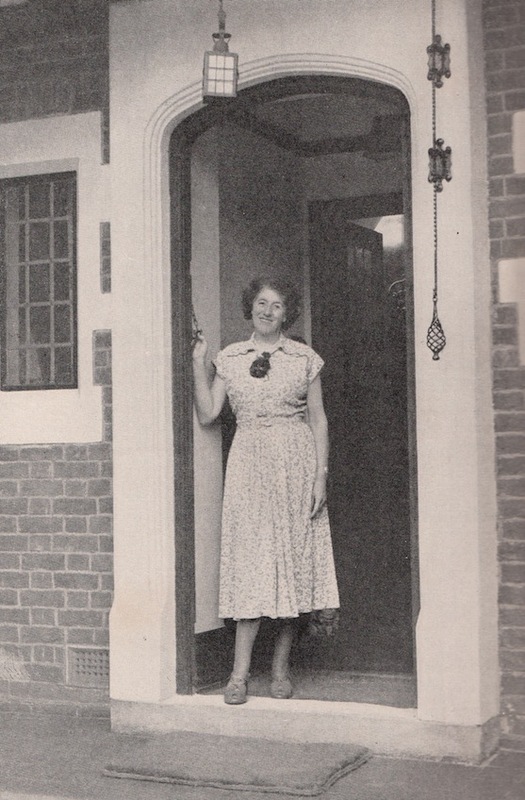 After all, Imogen was still at Benenden for several years and Enid both wrote regularly to her younger daughter there and visited. I know that the foreword suggests that, at the time of writing it, this was intended to be the final Malory Towers book. But she also intended the sixth Famous Five book to be the last, adn the sixth Find-Outers Mystery. By popular demand, she wrote many more of each. Don't tell me there was no popular demand for more Malory Tower adventures! It seems that, just as it was Gillian going up to Benenden that kick-started the series, Gillian's leaving brought the series to an end. Enid never wrote another series of school stories. Enid had been through school. Her first-born daughter had been through school. And that was it. Nothing more to be said. Time to move on. Pamela Cox has shown that there was indeed material for more books. She's written six further Malory Towers titles, concerning June, Felicity, Susan, with mention made of Darrell, Alicia, Gwen, etc. as well. In one of them, Jo comes back to Malory Towers, with a change of name to Alice, and through her selfless actions proves herself to be a changed girl indeed. Are these follow-up books any good? Probably. But I won't be reading them. 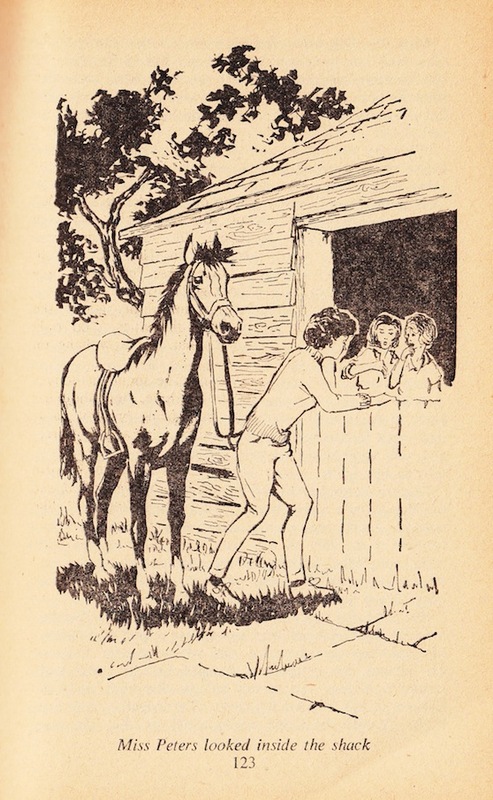 My interest is in the genius of Enid Blyton. That's what I'll be continuing to investigate from various angles on this website. Particularly from a biographical one. 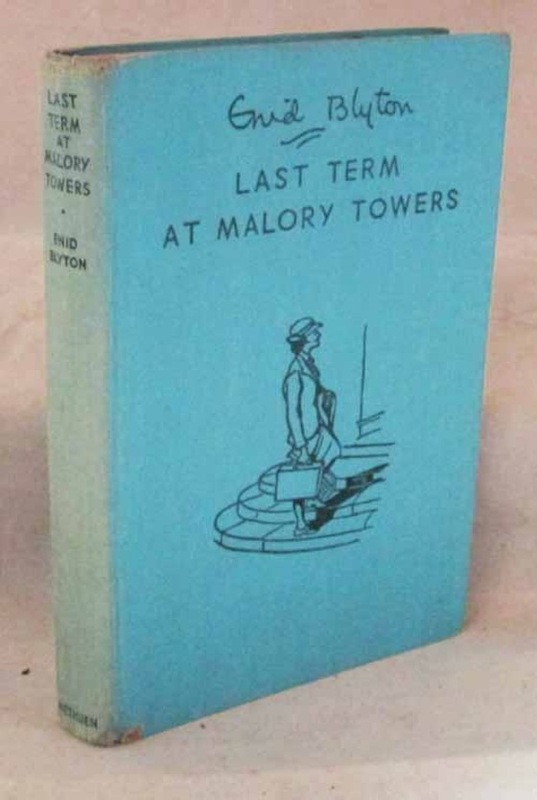 Last Term at Malory Towers was published in September, 1951. 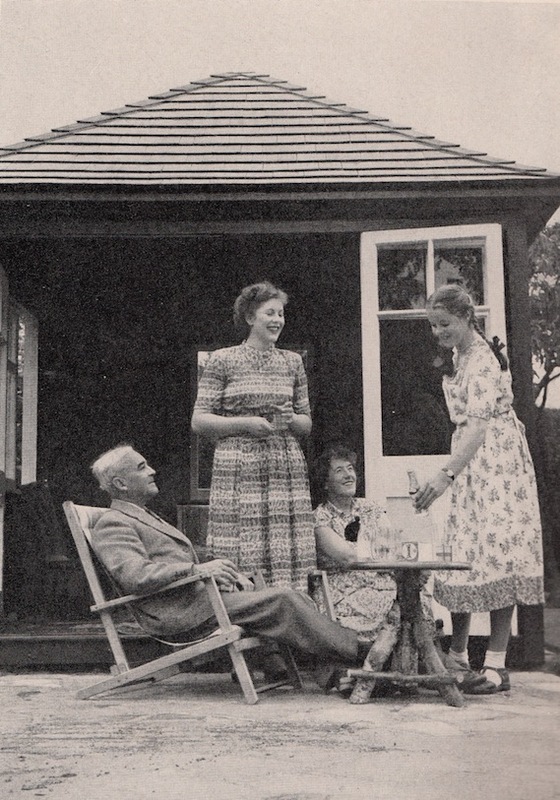 The Story of My Life was published exactly a year later and I suspect that certain of the photographs were taken in the summer of 1951. 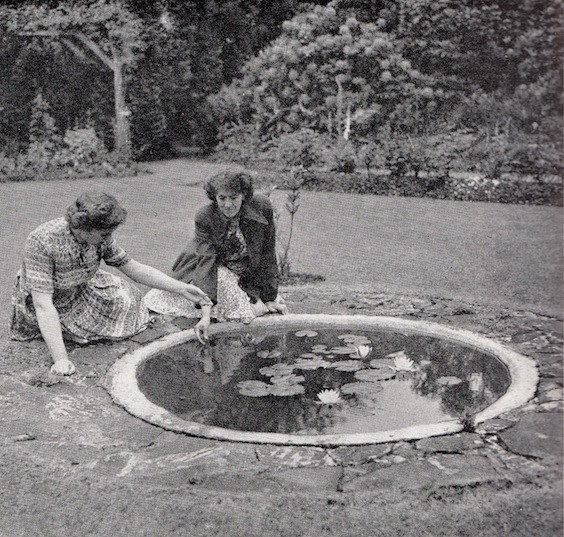 That is, with Gillian (sitting on the sun-warmed wall overlooking the rose garden at Green Hedges) having finished her first year at university and Imogen (kneeling) ready to go back into the fourth year at Benenden once the summer comes to an end. 'Have I put my own two girls into my books? Yes, many times, at all ages! Sometimes under their own names - but more often I have unknowingly taken bits of them, and given some of their ways and characteristics to children in my books. Gillian: "Mother, can I ask you something?" Enid: "If it's about Rob. The answer is still no. As I said before, you can't get married, you are too young. However, once you are 21 you will be old enough to make that kind of life-changing decision." Gillian: "No, it's not that. 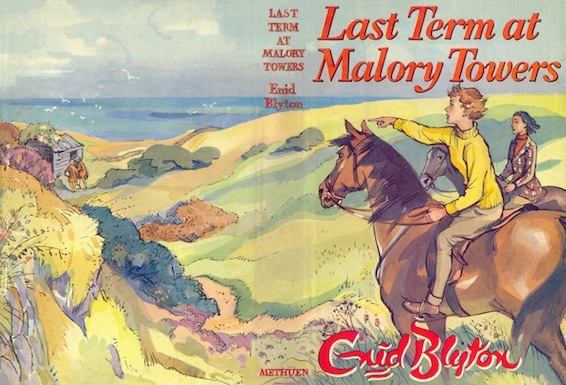 I've been re-reading Last Term at Malory Towers now that it's a proper book. I had the sudden fear that both Jo and Gwen are based on me. Is that true?" Enid: "Not a bit. Both you and I feed into Darrell's character. How could you be Jo or Gwen?" Gillian: "I sometimes feel I'm fat, vacant and hopeless." Enid: "You are none of these things. 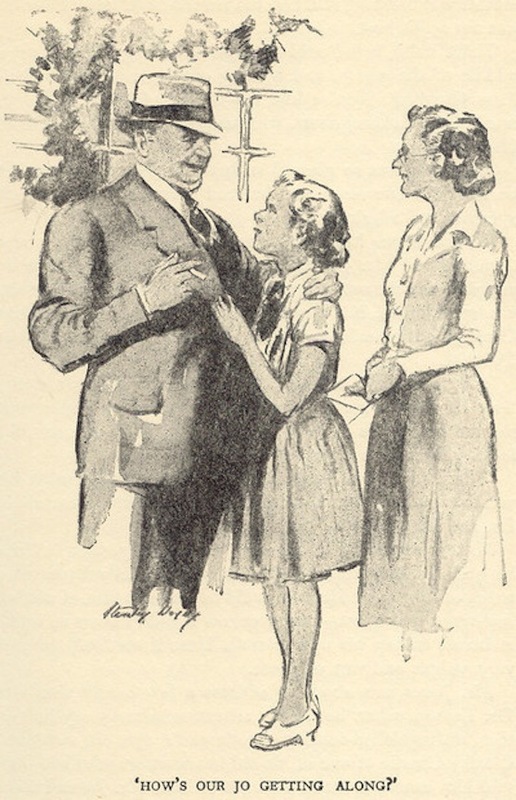 Besides, the essence of Jo is that she was spoilt by her father. Your father treats you with kindness, love and respect, he does not indulge you. Do you see that?" Gillian: "Yes, mother. Thank-you for reassuring me. Sorry to be such a woos." Enid: "Nonsense, Gillian. You are growing up to be a thoughtful, kind, independent-minded woman and I'm proud of you. Now let's join the others before Imo drinks all the lemonade." 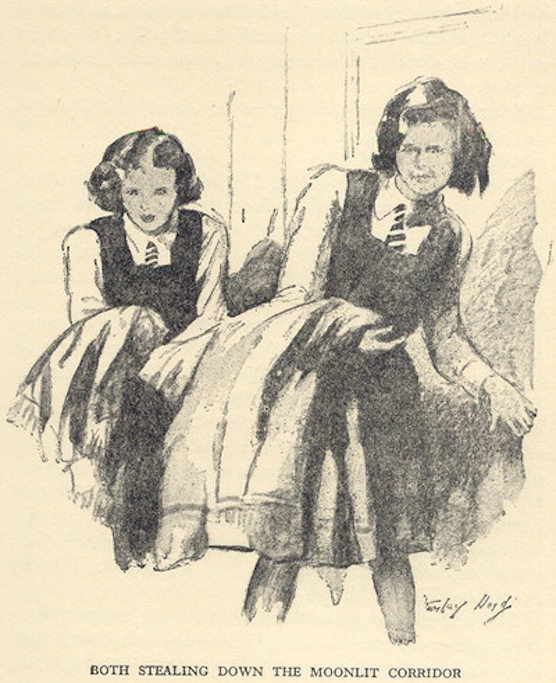 Enid: "You know, Imo, every day you remind me more of young June in Malory Towers, rather than Felicity Waters. I wouldn't be surprised to hear of you rowing out to sea to save a sixth-former from drowning next year. What do you think of that?" Imogen: "There are certainly plenty of them dumb enough to get way out of their depth. Trouble is, at Benenden we are an awful long way from the sea." Enid: "Oh, yes, I was forgetting. Silly me." 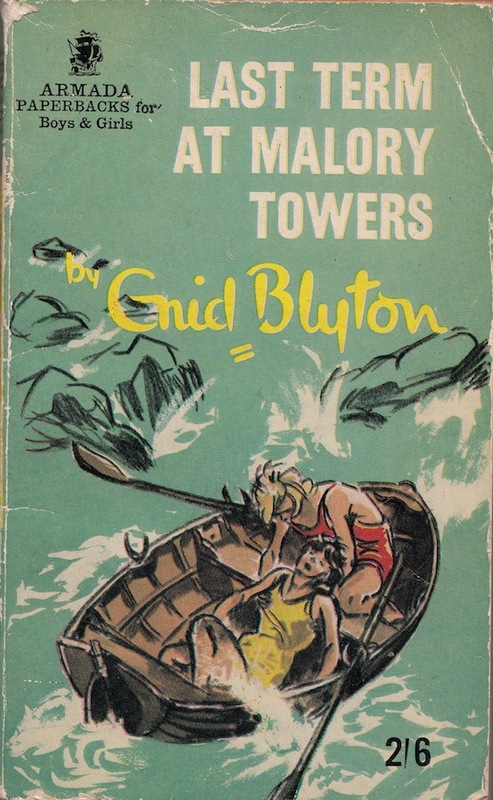 Enid wrote the Malory Tower books between 1945 and 1950. In that time she went from being in her late forties to her early fifties. The prime of her life. And in that prime she wrote all sorts of other books as well, including many of the best Famous Fives, Adventures and Mysteries. 'And then it really was all over. One last long clap, one last long shout - it was over. 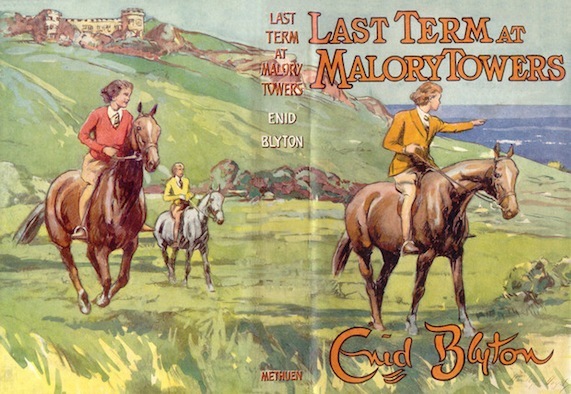 Acknowledgements: The scans of the dust-wrappers from the Malory Towers series, and internal illustrations from the original series, are taken from the Cave of Books on the Enid Blyton Society website, which is the work of Tony Summerfield. Note: If any copyright holder wishes an image to be removed from this page then they should contact me and I will do as they ask.